We had a great turn out for the awards ceremony from our last Winter Art Show. The Matthews’ Winter Art Show is now in its 39th year, January 17-25, 2018. The show is free and open to the public during business hours, Tuesday – Saturday, 10 a.m. – 5 p.m., in The Matthews art gallery. From beginners to professionals, the show is open to applicants of all ages, levels, and media. Show registration is not limited to geographical location. During the run of the show, patrons are able to vote for their favorite piece of art. The People’s Choice award is announced at the end of the show run on Jan. 25. Be sure to vote while visiting the show. ONE VOTE per person, please. January 17-25, Tuesday-Saturday, 10 a.m. to 5:00 p.m.
January 18, Thursday, 5-7 p.m. Awards are announced at 6:00 p.m. Don’t be late! Each work will be judged on individual merit and ribbons will be awarded accordingly. Ribbons will be awarded in all categories. Monetary awards will be awarded to first place ribbons in each category, with the exception of the Adult category. We now have 2nd and 3rd place cash awards. All ribbons will be given at the discretion of the judges. MOH does NOT award participation ribbons. The ribbon and prize breakdowns are as follows. Have your application filled out and ready to go before you arrive at registration. Jan. 10-13, Wednesday-Saturday, 10 a.m. until 5 p.m. Please READ the application all the way through. Download available soon. Jan. 18, Thursday, 5-7 p.m. The awards will be announced at 6 p.m.
Jan. 26, Friday: 10:00 a.m. – 5:00 p.m.
Jan. 27, Saturday: 10:00 a.m. – 5:00 p.m.
All work must be retrieved by the dates above. If not picked up during this time, it will be considered a donation to the Matthews Opera House & Arts Center. 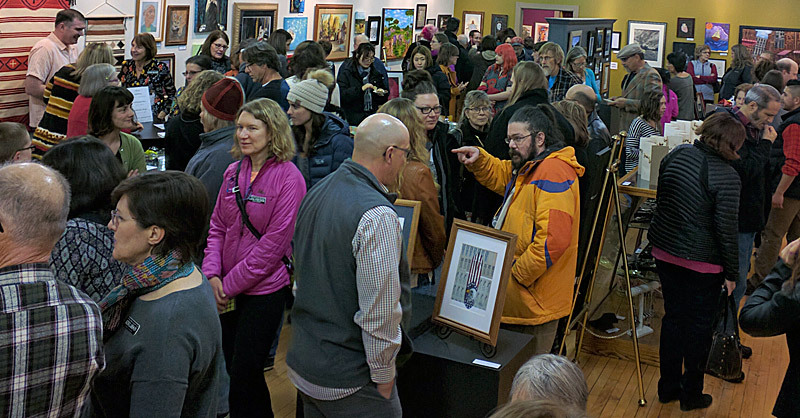 The 2019 Winter Art Show application will be posted in early 2019. There are important dates for registration, show dates, awards ceremony, and pickup. Also, all 2D work must be ready to hang with proper hanging wire. Work will be turned away if these guidelines are not followed. Applications are available at the desk in the art gallery or you may download the application. Thank you to the sponsors that help us bring art shows, plays, concerts, and other live entertainment acts to The Matthews. We couldn’t do it without you. KEVN Black Hills, South Dakota Arts Council, Great Western Bank, Killian’s Tavern, Black Hills Pioneer, Bay Leaf Cafe, City of Spearfish, DeSmet and Biggs, LLP, Forcoli & Sons Painting, Wolff’s Plumbing & Heating, Inc., Lucky’s 13 Pub, Spearfish Holiday Inn, The Apple Blossom B&B, Spearfish Motors, The Real Estate Center of Spearfish, Zonta Club of Spearfish, Optimist Club of Spearfish, The Matthews’ family, The Kelley family — CLICK HERE to visit these sponsors’ business websites. Would your business like to become a sponsor? CLICK HERE to learn more.